‘Tis the season to be jolly, Fa-la-la-la-laaaa! 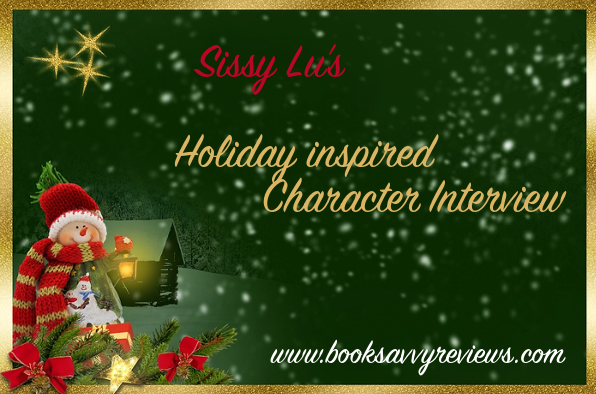 Introducing Sissy Lu’s first festive Character Interview, featuring Alice Carroll from Alice: The Wanderland Chronicles. Grab a cup of eggnog or some wassail, but beware the mistletoe! Alice, give us some small deets below! Favorite Season: Arizona really only has two: Summer and Not Summer. I prefer the latter. Favorite Hot Beverage: They have those? If I can find a warm soda in a can it’s a good day. 1. Why don’t you introduce yourself! Tell us who you are and what you do. Hi, I’m Alice. I’m just your average girl living in a post-apocalyptic world. I live in one of Phoenix’s smaller sectors where I help my sister, Dinah, act as the local medic. 2. What is your favorite thing to eat around the holidays? Unfortunately, holidays just aren’t the same since the outbreak of the Plague, but last year Dinah found a few cans of cranberry sauce and pumpkin filling. It was the closest to Christmas dinner we’ve had in a long time. 3. What is on the top of your Wishlist this year? I would love to add more books to my collection. I’ve read all of mine more times than I can count. 4. If you’re expected at a party are you usually on time or fashionably late? Honestly, I’d prefer to stay home, but if Dinah made me come, we’d probably end up being early. 5. What is your fondest memory surrounding the holiday season? The last Christmas before the Plague. It wasn’t anything crazy or super exciting, but Dinah, mom, and I spent Christmas Eve watching movies and playing games. It was normal. I miss it. 6. Are you a fan of eggnog or no? Let’s just say it’s not on the ‘Foods I Miss’ list. Now tacos on the other hand…. 7. There is mistletoe hanging in the doorway… are you going to kiss the person beside you or not? 8. It’s snowing outside, are you out there playing in it or refusing to step foot outside until the season turns? Snow would be a feat in the desert, although I could get behind a Winter Wanderland… See what I did there? *groans* Alright, yeah that one was bad. 9. If you could ask for ANYTHING for Christmas, what would it be and why? I’ve wished for a time machine to undo this whole Plague mess more times than I can count. But if, Time Travel is out, I would do anything to have my sister back. 10. What kind of shopper are you? Do you plan ahead of time or do you rush in a last-minute effort? Well, Dinah always made sure our scouting trips were pretty regular so we didn’t ever run out of anything. Although if it was up to me, I’d put them off for as long as humanly possible. 11. Did you ever believe in Santa? If so, how old were you when you stopped believing? I did when I was little. Mom did EVERYTHING she could to keep the magic alive. But then one year Dinah and I pretended to be asleep and snuck downstairs and saw her sneaking presents under the tree. After that, we knew it wasn’t real anymore, but we still pretended, even when we were teenagers. It became one of our traditions. 12. Who in your immediate circle is most likely to go caroling? Dinah. She’s so ridiculous. Last year she actually tried to start a caroling group. She even found an old Santa hat to wear. Nobody joined her though, so she ended up walking around the Sector singing Jingle Bells at the top of her lungs until her voice gave out. She couldn’t talk for a week. 13. If you could cast your acquaintances [including yourself,] in Scrooge, who would play what roles? Hmmm…. that’s a good one. Ok.
Scrooge: I don’t know… someone miserable. Maybe my dad. Bob Cratchit: Dr. Abbott- he has a lot of issues, but deep down, I think he’s a good man. Tiny Tim: Lewis. I don’t know why, but I feel responsible to make sure he’s safe. Fezziwig: Dinah. You remember the caroling story I just told you, right? Past Ghost: Chess. He could definitely act like a child. Present Ghost: Mom. She was so peaceful and beautiful, she would be perfect for that role. Future Ghost: Me. Then I don’t have to talk in front of anyone. I can totally stand and point. 14. Is there anything else you’d like to tell us? Things have gotten crazy in my life in the past few months, and things are about to get even crazier. I’m determined to find a cure for the Momerath Virus and to save my sister. I just don’t know how many people I’m going to have to fight to find it. Ho Ho Ho, did you know all of that about Alice? Bet you didn’t. Be sure to check out the author’s page as well as social media to ensure you are up to date on Alice and the rest of the crew! Fantastic answers! Thanks so much, J.M., where can readers find more about you and your books? About the Author: An avid reader and hopeless fangirl, J.M. Sullivan shamelessly fantasized that this was, in fact, her AUROR bio, but has since determined AUTHOR bio to be the next best thing. An almost Arizona native, she was raised in Phoenix, but when asked, she will tell you her formative years were really spent in the land of make-believe, where she passed countless hours with her favorite characters in their own worlds, Wonderland included. Eventually, society informed her that she had to grow up, so she experimented in retail, music, and business careers before realizing her passion for kids. She now works in Abu Dhabi as a middle school science teacher who fosters a love of science, literature, and learning in her students. Although known to dabble in adulting, J.M. is a big kid at heart who still believes in true love, magic, and most of all, the power of coffee. When she isn’t busy writing or caught in a daydream, she spends her time at home with her husband, their two cats, three kids, and a whole lot of madness. And she wouldn’t have it any other way. Alice must leave the safety of the Sector and venture into Momerath Territory to find the antidote – if it exists. Chasing a rumor about a mysterious doctor with the cure, Alice falls down the rabbit hole into Wanderland, where ravenous momerath aren’t the only danger lurking.